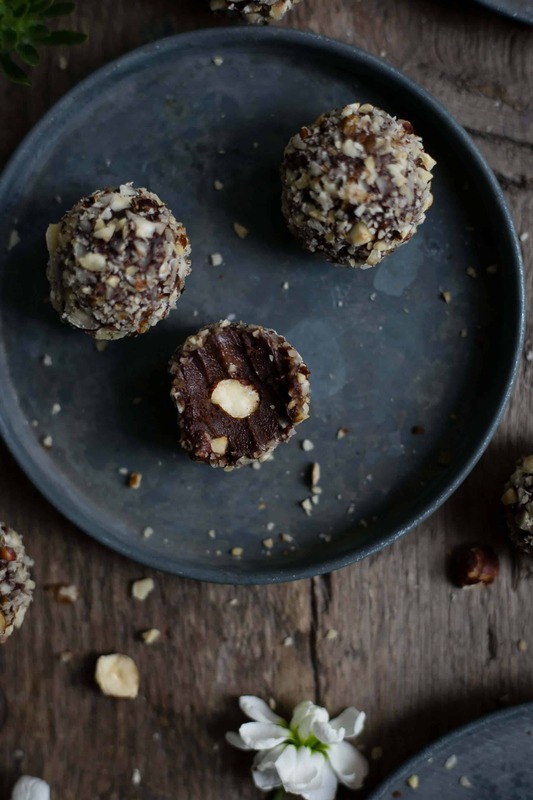 Absolutely delicious, homemade, vegan Ferrero Rocher truffles with chocolate and hazelnuts. You will definitely need more than one! Because it’s been so long (spiderwebs, tumbleweeds and dust everywhere! ), I thought I will treat you to something special today. So… here I am, with these delicious, reach, and creamy truffles, which are also happen to be 100% plant based. If that’s not a special treat, then I don’t know what is! And just to be clear, I have called them Vegan Ferrero Rocher because they look and taste almost like a real deal! Because there is no thin wafer layer, I’ve used word ‘almost’ rather than ‘exactly’. Although, I’m aware that some of the most devoted fans of this famous chocolate and hazelnut treat, may not find it appropriate for me to use that term… As they say… you can’t please them all! 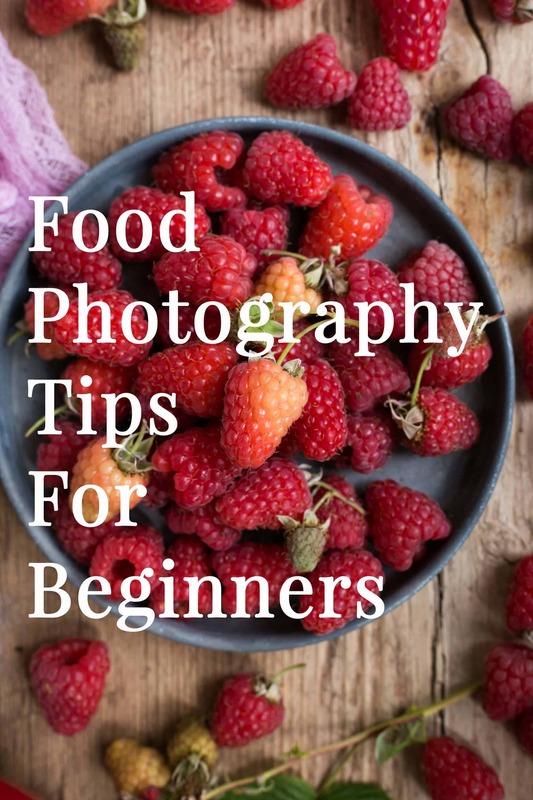 When I started my journey with food photography and blogging, I would spend ages looking through a beautiful galleries and websites, searching for some recipes and inspiration. Quite often, I wouldn’t dare to make something, that other blogger/ fellow cook/ foodie made for their website, out of fear. Fear of being accused of copying someone, or even worse, stealing their ideas (which actually happened to me in the past, and it was an awful experience). Now, I’m obviously not going to advise you to go and just copy someone’s else work and content, because that is just eeeek and a BIG no-no. What I’m trying to say, is that it’s OK to be inspired by someone else. It’s OK to try to recreate someone else recipe, picture or idea. As long as you include and mention the relevant credits, as long as you admit that your work, or particular picture or idea has been born thank to ‘xyz’ , it’s OK to use it or even re-create it. It’s also absolutely possible, that two (or even more) people, had almost exactly same idea in the same time. It’s not unusual for me, to take picture of something, just to discover someone on Instagram has shared almost exact same idea, 10 seconds before I did. At the end of the day, we are all inspired by something or someone, when it comes to our work. Is it really possible to come up with the recipe, that has never, ever ever been created by someone before? Aren’t all the recipes/ ideas born as a result of something, that someone else did before us? And as mentioned above, as long as you give the relevant credits, where they are due, and as long as you don’t just blindly copy someone’s work word by word, and as long as you admit that you have been inspired by so and so, there is no shame in re-creating something, that has been done before. What’s even better, the person who inspired you, or who’s recipe you have re-created or based your recipe/ photo/ idea on, will more likely to feel super flattered and over the moon, when you mention that it’s them who you want to thank for it! As online creatives, we all have certain interests and hobbies and passions. And it goes without saying, that there is more than one person out there, who is interested in food photography, for example. As we have similar interests, we are more likely to be moving in the same circles, looking at similar photos, admiring work of the same creators, being inspired by the same person. As a result, we may create very similar work. And often, it’s even without knowing each other. Because it’s possible for two creatives, to have the same idea. So don’t get upset or stressed or angry, if you see that someone else posted almost an identical picture to yours. Instead, congratulate them! Tell them that you have also come up with the similar idea. Tell them that you like it, and that you like their take on it. Share your work with them, so they can see what you have come up with, and more likely, they will also congratulate you! There is a very thin line between stealing and copying ideas, to being inspired by someone. The difference is, to simply be honest and open about it, and tell the world who it is that sparkled that idea in you! 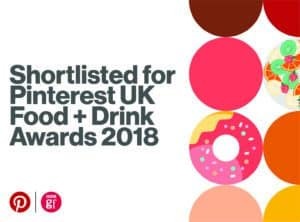 I do feel like there is a bit of a stigma in the blogging (especially food blogging) world about it, and I hope that this post will encourage at least some of you, to just go and create whatever it is you fancy. 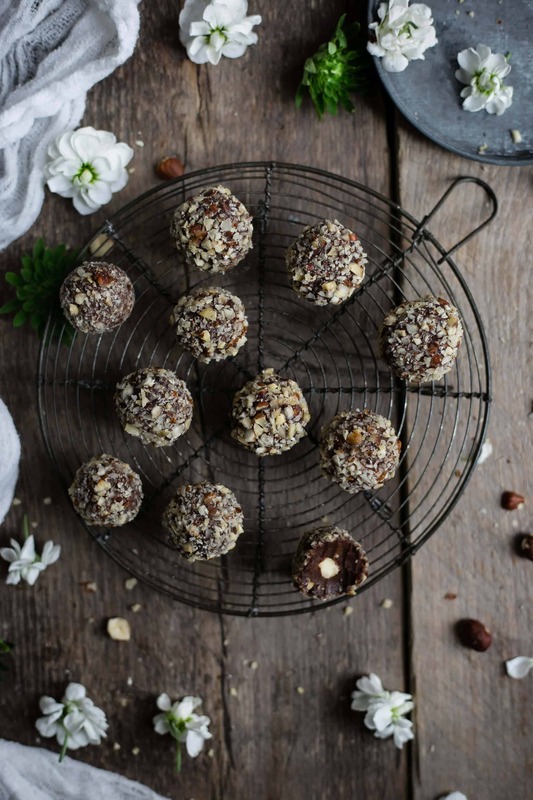 The recipe for these vegan Ferrero Rocher’s is inspired by Rachel from Rawberry Fields, and her Raw Ferrero Rocher recipe, which you can view here. 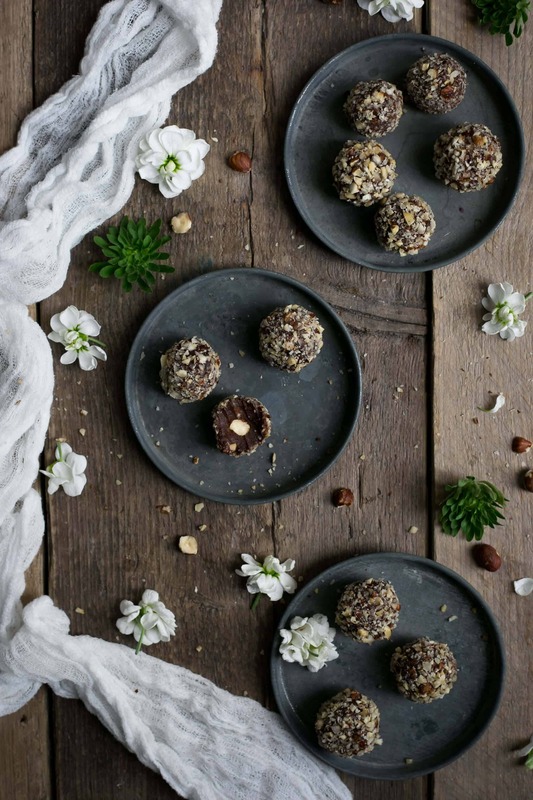 I like to add a bit of maca powder to mine, purely because I do love that earthy, buttery taste of maca, plus it tricks my mind into thinking, that these chocolate truffles are healthy (which, in a way, they are, comparing with the shop- bought version!). Because the whole mixture of the ingredients tends to melt very quickly, I would highly recommend to work in small batches, and store the rest of it in the fridge, until you are done with the current batch. 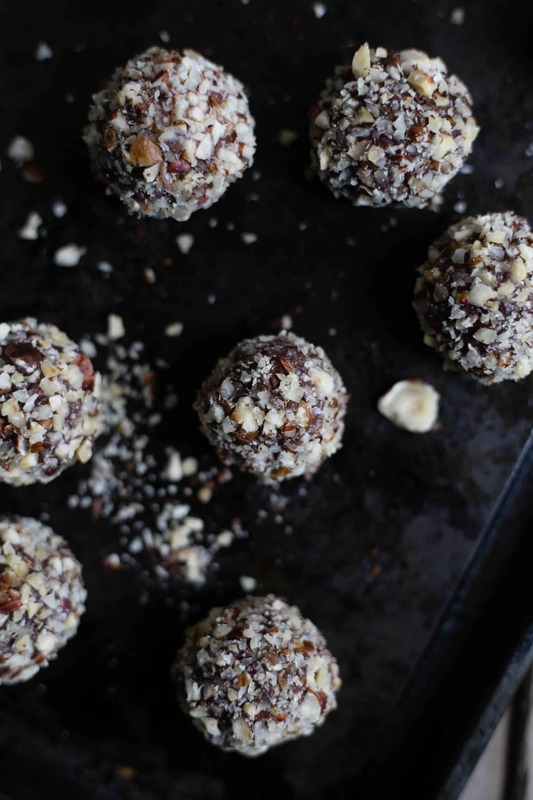 Once all of your vegan Ferrero Rochers are rolled and coated in roasted hazelnuts, put them in the airtight container, and place back in the fridge (if you can resist demolishing them all straight away!). After about 30 minutes, they will harden a bit more, and will be ready for you. If you do happen to have any left, they will keep well in your fridge for up to 7 days! Have you got any thoughts on today’s post? Do you think it’s OK to be inspired by someone else work and re-create it? I would love to know what you think and what experience you have on this subject. Let me know in the comments section below! Delicious, creamy, chocolatey treat, with crunchy hazelnut coating. Chop the dark chocolate into rough pieces, and place in a glass bowl over the simmering water, allowing it to melt. Once chocolate has melted, remove from the heat, keeping it over warm water. Pour the coconut milk into a small pan, add sea salt and maca powder (if using), and warm it up, but do not boil it. Take off the heat, and slowly pour it into melted chocolate, stirring constantly (don't worry if it hardens or becomes grainy, just keep stirring until it all combines). Add nut butter, vanilla bean paste and maple syrup, combine all together, and set aside, allowing the mixture to cool down to room temperature. Once it's cooled down, place the mixture in the fridge overnight. Reserve about 24 hazelnuts, and set them aside. Chop the rest of the hazelnuts into fine pieces, and spread them on your chopping board. Scoop the equal portions of the mixture into your hands, and flatten it a little with palm of your hands. Place the whole hazelnut in the middle, then roll the mixture over the nut, forming a small ball/ truffle. Cover in chopped hazelnuts, and place on a clean tray. You will need to work quickly, as the mixture may start melting (it's good to divide your mixture in batches, and work with small amounts, keeping the rest in the fridge, until you need it). Transfer your Ferrero Rocher into a container and store in the fridge. Hi Anna! 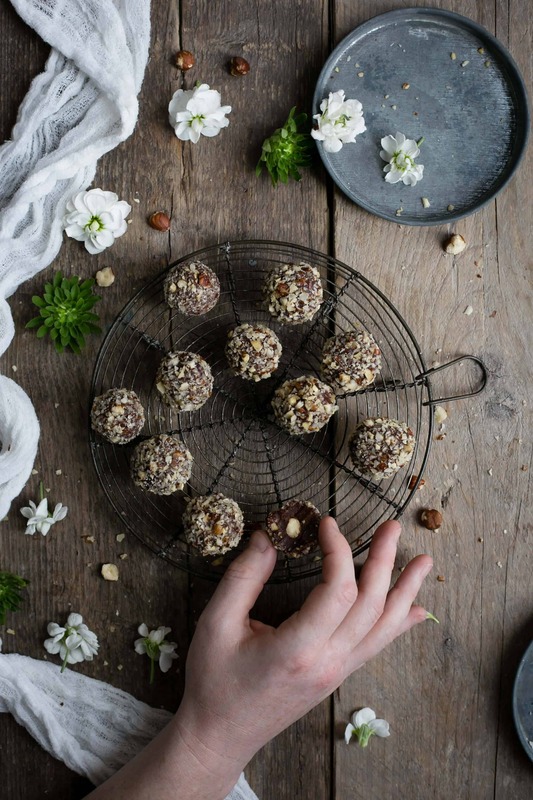 And you have done it again – yet another recipe which sends my taste buds into a frenzy just by looking at these beautifully photographed treats! As a Ferrero Rocher addict, I will probably end up eating half of these whilst making (I call it ‘obligatory recipe testing!). I totally agree with you on the recipe/photography inspiration front. We all get inspired by someone or something. 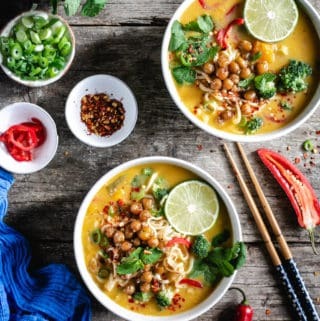 I personally get a lot of my recipe inspiration online and also by eating out – if I’ve tasted a great dish, I’ll be sure to recreate it at home and put my own spin on it. Hah, Tania! I’m more than familiar with that obligatory testing, and this one will definitely require a lot of it! And thanks so much for stopping by! I’m so glad to hear you agree and understand what I mean! Your support means a world to me, and I’m looking forward to meeting you soon! Glad to see you back in action, we’ve just got back from our holidays on Sunday, and trying to get back to the normal routine… so I’m sorry for not being around here more recently! But ohhh, looking at this post and your vegan ferrero rocher made me drool so much! Your photography skills are evolving so much, and I just love the dark mood! As for the recipes, I couldn’t agree more. Yes, some ‘recipe developers’ out there will claim to make the certain recipe all by themselves, but the chances are, they have also based it on some other recipe… and I think that as long as you disclaim who or what inspired the recipe, it’s fine, at the end of the day, the recipes are there to be tried, and enjoyed and shared! Jo! I’ve missed you! So kind (as always!) of you…They are really delicious, and so easy to make, but next time, I will make a double batch, just because they were gone too fast! 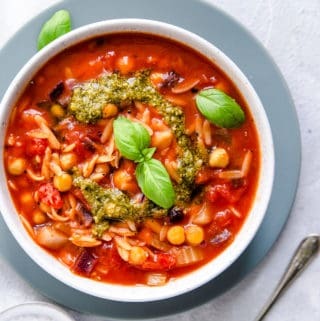 Recipe development is no doubt a hard work, but I also agree with you, it’s really hard to say that a recipe is truly yours… Let me know as soon as you try it! You’re so right, no one ‘ownes’ a recipe and as long as you credit it correctly it’s all good. 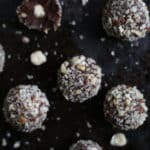 I love Ferrero Rocher too, and looking at this pictures made me want to try this recipe straight away! Made these couple of days ago, and they are lush!!! 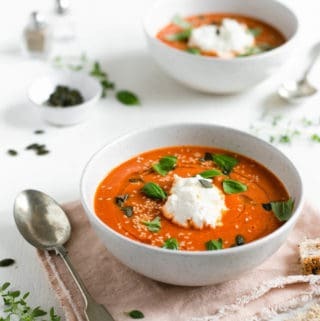 I would recommend to refrigerate them for a bit longer (if you can control the temptation of eating them all straight away), as the texture is much better, perhaps even leave in the fridge overnight and then eat. But they taste incredible! Super creamy, and very very good! Thanks for great recipe! Melissa! You just made my day with this comment! I’m so happy you’ve tried them and enjoyed them! Yes, you totally right, if you leave them in the fridge overnight, they will firm up much better. As you can see, I couldn’t wait… ??? ?